This film is a beautiful and lyrical meditation of what could have been. What if things would have happened differently? 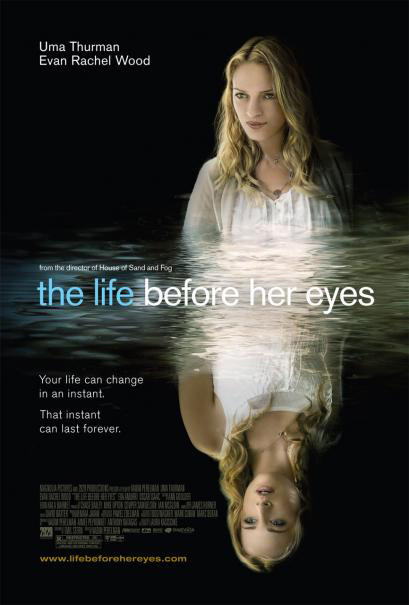 The Life before her Eyes is the second film from director Vadim Perelman, whose first film The House of Sand and Fog brought wide critical praise. It was nominated for three Academy Awards, including best lead actor for Ben Kingsley. "The Life Before Her Eyes" stars Uma Thurman and Evan Rachel Wood playing the same character of Diana. As a teenager (Wood) she is a free-spirited girl who is caught in an unthinkable situation. When a boy at school goes on a shooting rampage she and her best friend become trapped in the bathroom with him. The story then flashes forward and we see Diana all grown up with a husband and a young daughter. She is continually haunted by the events of that day and the kind of person she was back then. She tries to protect and nurture her daughter onto a better path but she looks to be failing. Her husband is a professor at a local college and could be having an affair. The plot swaps back a forth between the young Diana and her best friend Maureen, played by Ava Amurri and the older Diana and her family. It chronicles the building of young girls’ friendship and how they have arrived at the point when they are facing down the gunman. While Maureen is religious and chaste, Diana is quite liberal and currently seeing an older man. They are complete opposite personalities, but as friends, they were made for each other. The movie is beautifully shot and wonderfully acted. As far as casting goes even though Evan and Uma have similar looking faces, their body types are quite different. The timelines of events for Diana are also a bit sketchy. There is a big twist ending that is a quite debatable and could turn some people against this movie. It could also explain some of the inconsistencies. It deals with some pretty heavy issues to the point of being overstuffed, but it is a good experience overall. The DVD contains many special features including a director’s commentary.